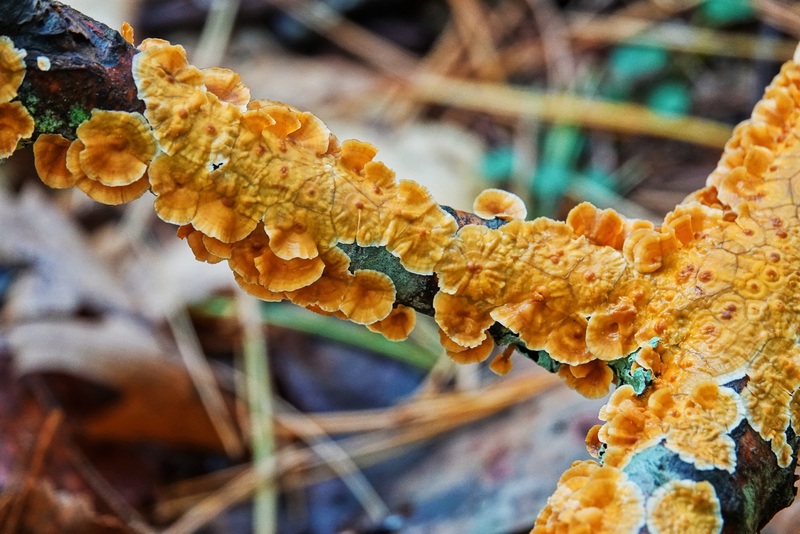 Fall has produced an abundant crop of interesting scale fungi on the fallen limbs at Rachel Carson National Wildlife Refuge. There is a beauty in the patterns and the shapes, at least to my eye. Sony RX10iv at 489mm equivalent. In-camera HDR. Processed in Polarr. This is my second shot of “the tree that holds up the sky…” for this year. 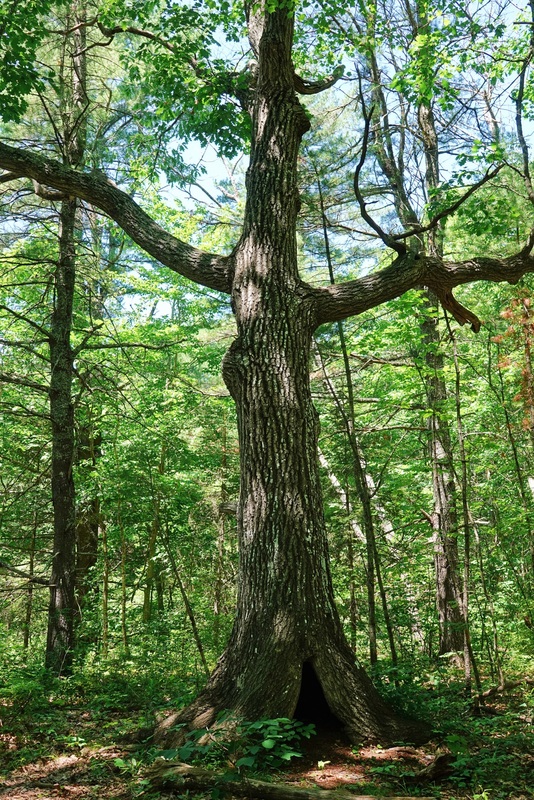 It is, of course, just a particularly attractive, and big, tree at Emmon’s Preserve along the Bascom River in Kennebunkport, Maine. But it definitely has a “the tree that holds up to sky” feeling to it, or so I think. 🙂 Sony RX10iv in-camera HDR at 36mm equivalent. Auto HDR mode. Nominal exposure 1/160th @ f3.2 @ ISO 100. Processed in Polarr. Under the winter pines. Happy Sunday! It snowed all day yesterday. After clearing the drive (lunch and a rest) I decided to brave the snow covered roads at least as far as Rachel Carson National Wildlife Refuge headquarters where I was pretty sure I could get in to park and walk in the snowy woods. I was all suited up for the adventure…longjons base layer to high snow boots and a fleece lined parka. I took my umbrella as I hoped to take some pictures and I wanted to keep the camera relatively dry. The woods were quiet. I was the only one foolish enough to brave the roads and the unplowed Rachel Carson driveway. The light was subdued. Snow fell steadily, in big flakes, to continue to fill the wood. Every tree and bush carried its burden of white. It was…I am tempted to say “magical”, but I don’t, on principle believe in magic. We hear a lot about “magical thinking” today. Many people seem to believe that results can be achieved without effort if you just know the right thing to say. And many more seem willing to believe that our leaders will be able to achieve what they want, and have promised, just by saying it so and waving a hand (or wand as the case may be). And apparently there are those who want to be deceived by slight of hand, for the entertainments’ sake. They find it amusing, and admire the skill of the trickster. If you stop to think about it, magical thinking explains a lot about what has happened recently in American politics. But then, everything we see is if we look with the generous eye. Happy Sunday! Snow. 120 Brown Street. Kennebunk Maine. Carol and I were in New Mexico when the first snow fell in Maine, but we were home yesterday and watched, Frost like, the woods fill up with snow. It snowed most of the day, but never heavily, and by late afternoon we had about 2 inches on the ground. 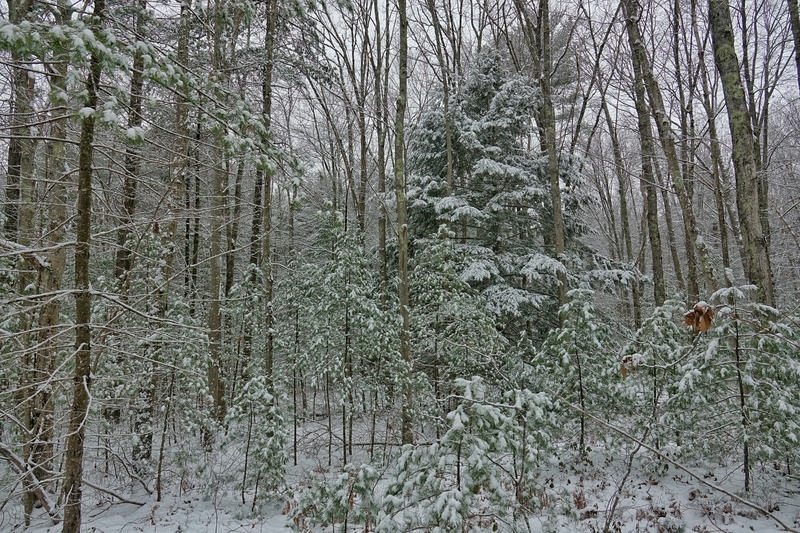 Gentle snow, and very little wind, so even that little bit built up on the evergreens to look like a much heavier fall. This is a little patch of mostly second growth forest (or 10th growth for all I know) just across the road from our house. 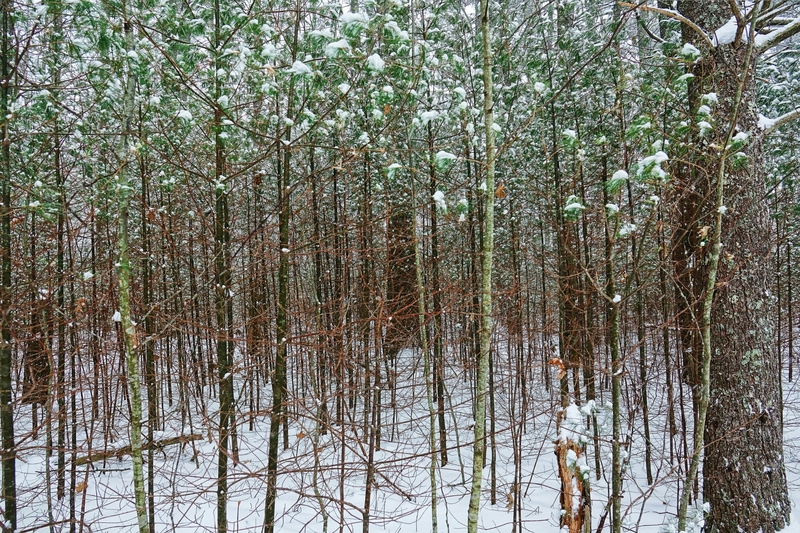 It is posted, but I worked my way just far enough into the woods for this pic of the newly fallen snow, about 2:30 in the afternoon, before the light failed completely. There is always a quiet beauty to freshly fallen snow. Sony RX10iii in-camera HDR. 24mm equivalent field of view. Nominal exposure: 1/100th @ f2.5 @ ISO 100. Processed in Snapseed on my Android tablet. 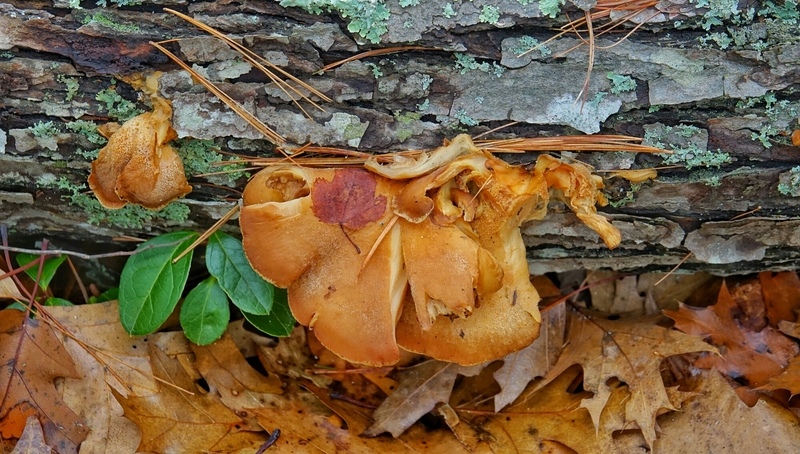 Found on the forest floor. Happy Sunday! Photography is essentially the art of putting the world in frames. All the technical stuff matters…exposure, white balance, focus, image quality, etc…but it does not matter nearly as much as what is and is not inside the frame, and how the elements inside the frame work together to fill the frame. The frame is our focused attention…it says “look at this and see what I am seeing.” The only talent a photographer has is his or her vision…the rest is skill, and can be learned with enough teaching and practice…but the ability to see what needs framing, and how it fills a frame…that is the gift that sets the photographer apart from the casual snapshot shooter. (And the world being what it is, even those who consider themselves casual snapshot shooters may have the gift, and many who consider themselves very skilled in the techniques of photography may, apparently, lack it.) It is a gift…it can be developed like any talent…but it can not be acquired or learned. Dr. Suzuki, creator of a well known system of music education, believed that musical talent is a gift that is given to all children, and that it only needs to be developed from an early age, to allow every person to enjoy and to make beautiful music. To him, hearing music is equivalent to seeing beauty…to seeing how the world fills the frame of our attention…and the skill of actually playing an instrument can be taught and learned. It only requires practice. I believe photography is the same. Everyone, as part of his or her birthright, has the ability to see beauty, to appreciate the harmony and energy of the world, and if given a frame can place it effectively it to say “look at this and see what I am seeing”. Being a man of faith, I believe that gift is part of our birthright as children of God…part of the “created in God’s image” truth that can and should shape our lives. It is part of the generous eye…part of the light within us. And, again, looking with a generous eye, I see evidence of the gift of God at work in people around me, whether they are aware of it or not, in every effective photograph. Whether on Facebook, or Google+, or Instagram (or wherever you look) the digital stream today is full of images that testify to the light within us. It is a common complaint among “skilled photographers” that today, anyone with a phone thinks they are a phtographer. Isn’t it rather, that today everyone has a frame, and more and more people are discovering that if they put it around the the things they see and value, others can share that value. And isn’t that something to celebrate…and to enjoy? 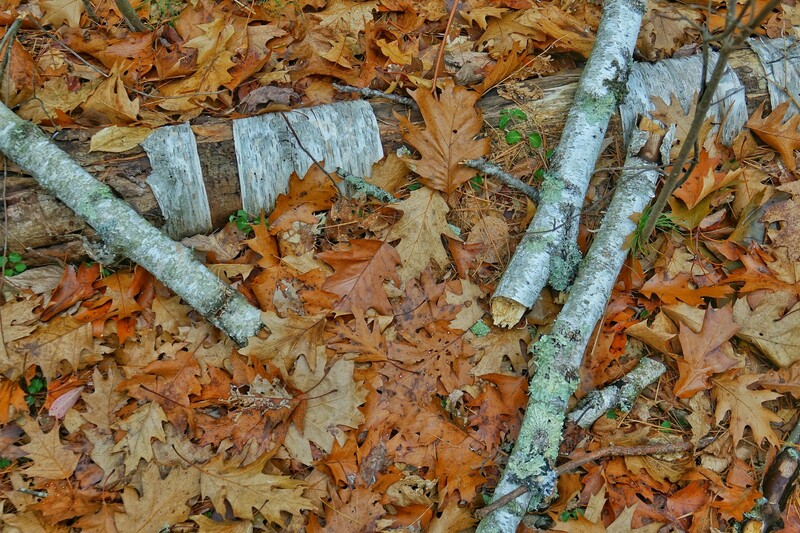 I saw this apparently random arrangement of sticks and leaves on the forest floor, on a wet fall day. The textures, the colors, the angles formed by the white birch branches caught my eye, so I took the frame of my camera and put it around what I saw, being careful to fill the frame so that you could see what I saw. That is my only gift. And now it my gift to you. Happy Sunday! My wife and I took a walk around the loop trail at Rachel Carson National Wildlife Refuge near our home in Maine yesterday. The day was overcast, a real late November fall day…no snow yet here in Southern Maine (like most of the nation). The forest was largely bare. Even the oak leaves were all off. The fungi on fallen birches and maples showed easily with all the undergrowth died back. This found still-life was just off the trail. I like the mix of textures here, the way the wintergreen pokes out beneath the fungi, the way the small maple leaf rests, and the richness of the damp colors. Sony RX10iii in-camera HDR. 200mm equivalent field of view. Nominal exposure: f4 @ 1/200th @ ISO 800. Processed in Snapseed on my Android tablet. Cropped for composition. Here at the height of a unusually hot summer in Southern Maine, we have fewer dragonflies than I remember from last year. I went to Emmon’s Preserve in Kennebunkport yesterday in hopes of finding Mosaic Darners patrolling the meadows, but there were none at all. Lots of mosquitoes…probably, in part at least, because there were no dragons. The Mosaic Darners are among my favorite dragons. They big and generally boldly marked, and there is a certain elegance to their wasp wasted look and elaborate male appendages. When I found little to photograph (and the sun very hot) in the open meadows at Emmon’s, I decided to drive the mile or so to Smith’s Preserve, where the trails are shaded by the forest. Parking is limited at Smith’s, and sometimes completely taken up by SUVs with bike racks, as the trails are very popular with mountain bikers. (SUVs with bike racks…that is a sad comment on our times.) I did find a place to park (the last one). 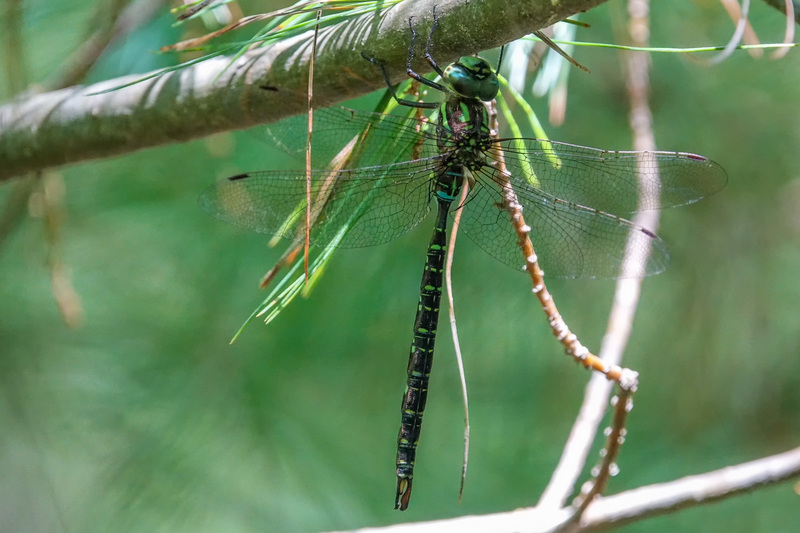 It was quiet at Smith’s as well, though there was more bird song, and it was considerably cooler, and I did spot this Mosaic Darner patrolling a section of the trail. It hung up on a small pine along the side, and I was able to work my way close enough for a photo. I am thinking this is a Shadow Darner, but I could be wrong. The light was not ideal in the deep shade, so this image is taken at ISO 1250. (1/250th @ f4 @ 541mm equivalent, zoomed back a bit to fit the full bug in). During processing in Lightroom, I ran it through the NIK Define 2 filter to eliminate some of the noise. I have never been so aware of the light as I am these weeks in December, just at the solstice. Our odd weather maybe is helping…as I am out, and further out, than I generally am at this time of year. The light, even at noon, is just skimming the earth…coming in a such a low angle that it illuminates things I do not normally see, and turns the mundane magical. 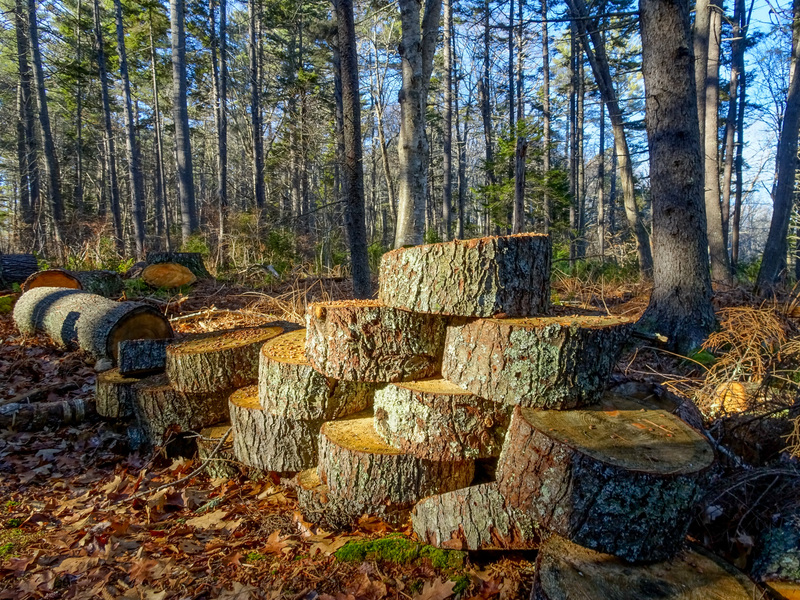 Take this random pile of tree sections beside the trail at Laudholm Farms. I suspect they are piled and waiting for staff to come and haul them out, but the solstice light turns them into a study in shape and texture, color and form. On any other day I would have passed right by…but in this light I was stopped in my tracks and forced to record the scene. Of course, this morning we have 7-8 inches of fresh snow on the ground…so everything will be very different today! In-camera HDR. Sony HX90V at 24mm equivalent field of view. 1/60th @ ISO 80 @ f5. Program shift for greater depth of field. Processed in Lightroom. 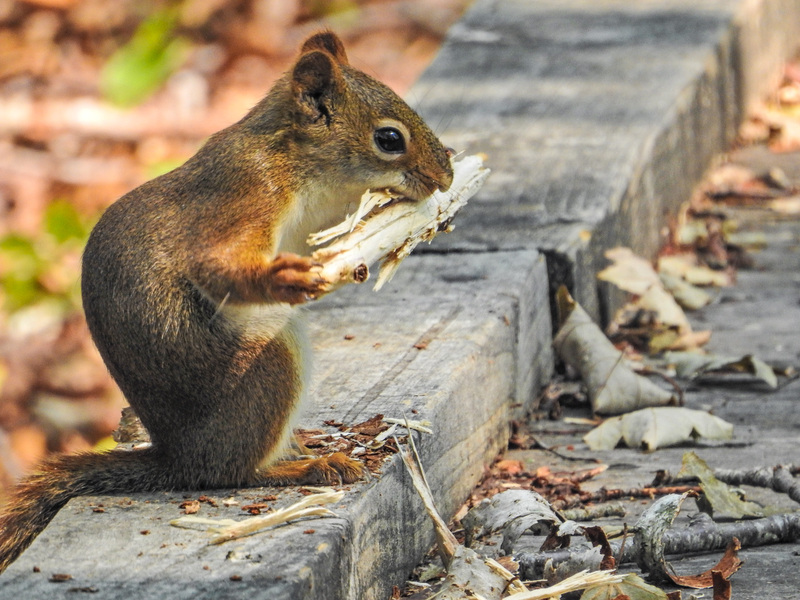 This might actually be the same Red Squirrel I encountered on the Laudholm Farms boardwalk a few weeks ago. It was certainly in about the same area. However, if you remember, on that encounter the squirrel was relatively shy, if determined. It would allow me to approach to within about 20 feet, and then it would lose its nerve and scamper on down the boardwalk to find another seed to eat further away. I moved it probably 150 feet down the boardwalk before it scampered off into the forest. 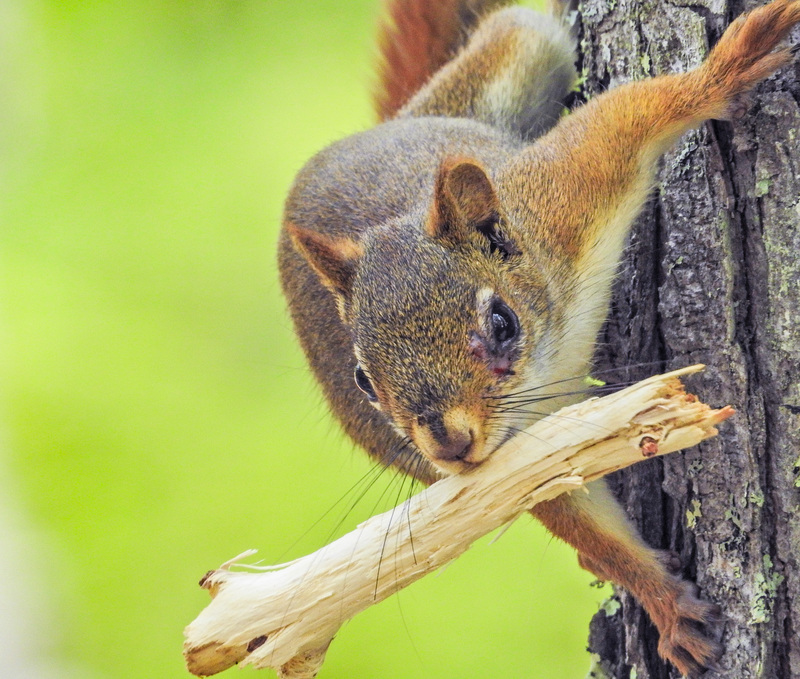 This time, the squirrel seemed determined to defend its stretch of boardwalk. I felt like the Borlog and the squirrel was Gandalf. He would leap up to a tree and threaten me, than he would plant himself firmly on the little 3 inch tall rail of the boardwalk and glare a clear message “you shall not pass!” Then he would charge me. Me. He charged. The squirrel. Tail twitching. Ears erect. Eye to eye. 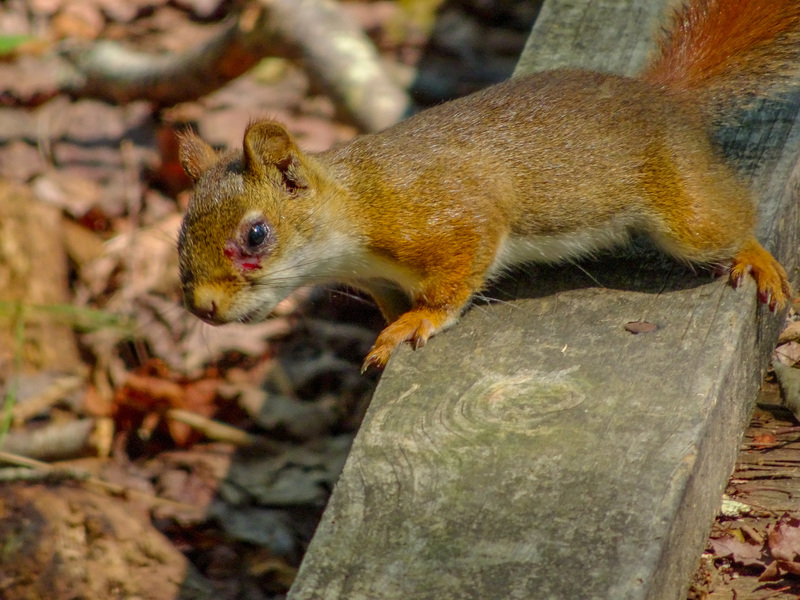 He charged down the rail to within six feet of me before thinking better of it and flying off into the forest…only to land right back on his tree and then the rail where he had started: 20 feet from me and glaring. Not only that, when I first saw him he was eating, relatively speaking, a log. You see it here. He was sitting up, holding this stick in his paws like a giant cob of corn, and was breaking it up and extracting something from the pulp. In his first few charges at me he carried the log with him, and even after he dropped it, it might have been what he was defending. Eating his log like corn. The first two shots are with the Nikon P900 at 2000mm equivalent field of view. The last shot is with the Sony HX90V at 720mm equivalent field of view. I switched cameras because on his close approach the squirrel was inside the closest focus on the Nikon. 🙂 Processed in Lightroom. It is just about Ebony Jewelwings time of year again. After my encounter with the River Jewelwings a few weeks ago (here), I went back to the rapids on the Batson River on Saturday to check for early Ebonys, and there were indeed a number of males dancing over the rapids and pools. All Ebonys, no River…which is, I think, an interesting thing to note. And I found no females, either near the river in the forest, or in the meadows. Maybe next week. 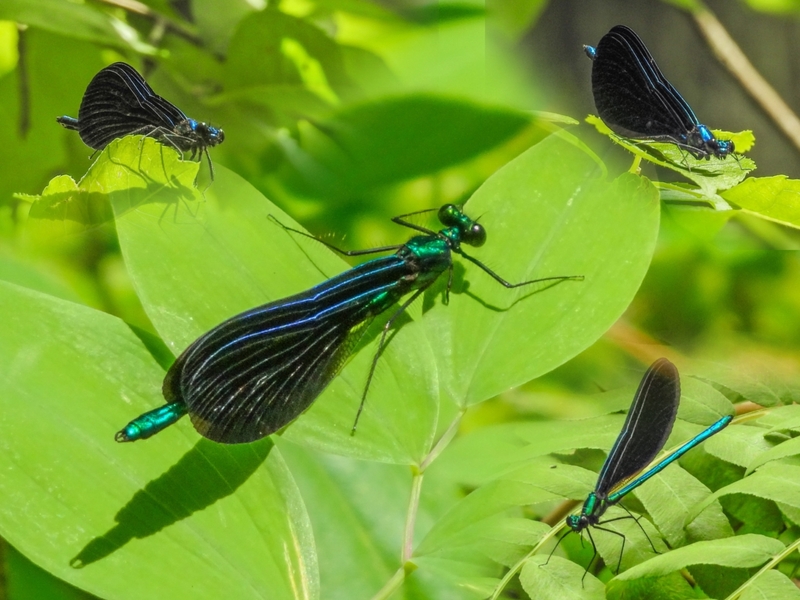 There is, of course, nothing like the iridescent blue/green of the Ebony Jewelwing’s body…sometimes bright blue and sometimes bright green, depending on the angle of the light. The center image is from the Sony HX90V and the surrounding images are from the Nikon P900. All are processed in Lightroom and assembled in Coolage. Coolage is such a great program for this kind of panel!